When it comes to the systems that I already own and actually play (i.e., the 3DS), there are only a few games I'm looking to pick up between now and the end of the year. One of them is Pokémon X. 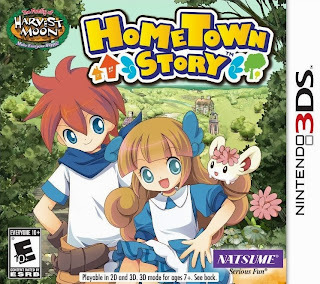 Another is Hometown Story, the adorable-looking life-simulation game made by Harvest Moon creator Yasuhiro Wada. I've had the latter pre-ordered since Amazon first allowed me to do so a month or two ago, and I absolutely can't wait for it to arrive on my doorstep sometime between Oct. 22 (when it's due to be released in North America) and the end of the month. In the meantime, I thought it might be nice to devote a "Which Box Art is Better?" post to this title--especially since the cover art for the Japanese version (releasing on Dec. 12) finally found its way onto the Internet yesterday. Sadly, I've yet to come across the European iteration's cover art. Of course, the game doesn't have a solid release date in that region yet (just "Q1 2014"), so maybe that's why. Anyway, which piece of box art do you like best? Me, I like both of them--although if I were forced to say I preferred one over the other, I'd probably go with the Japanese option. I like that it's less cluttered than the North American one (which has far too many logos and call-outs) and I also like its central illustration is softer and more focused. I prefer the Japanese one as well, for its focus on the characters. Less boring space! Yep! The only thing I don't like about the Japanese cover is the placement of the logo. It seems a cramped in that version. Oh, well, both are more than nice enough, IMO! I like the Japanese one, for sure. I've never actually heard of this game, but now I'm incredibly interested! Well, I'm glad I could make you aware of it, Justin! I'd highly recommend reading a few previews of it and hunting down some videos. I have to admit that it looks a bit "cheap" (very "mobile game-ish"), but it also looks really charming. So, I'm looking forward it. Just a few more weeks! 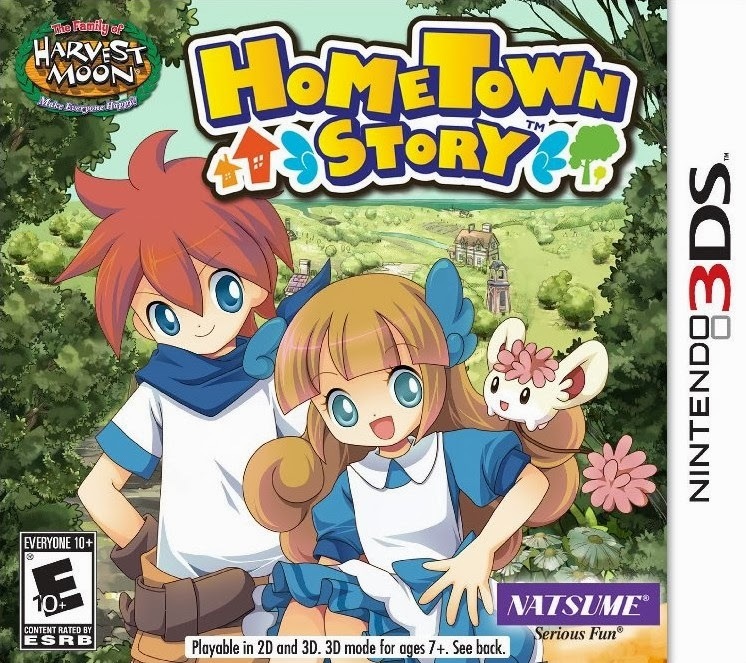 I like the U.S. box art, with the trees and fields a few buildings in the background instead of empty sky. Also, the girl is on more equal footing with the boy compared to the Japanese box, where she's almost hiding behind flowers. I have to give the US version props for being obvious in the What They Were Thinking game! Like Zaphod said, the girl is front-and-center, whereas this plays down the immediate gender stereotyping considerable. Panning back to show a background of some sort also hints at the world and possibly what the game is about. The Japanese cover could literally be anything! And besides the additional clutter, they've included a reminder that it's related to Harvest Moon. (And really, how else are you supposed to know?) So I'd definitely call it a success! softer-looking in the Japanese version. I wonder how much more rounded they could have made the font without making it look "balloony?" We're definitely on the same page, Michael. Both are good/successful for different reasons, IMO. Also, you're completely right in saying that the Harvest Moon logo makes sense, esp. on the NA art--even if I do think it adds to the clutter--as that's sure to pull in a few people who otherwise would pass on it, I think. BTW, have you and I discussed the NA Animal Crossing logo before? As in, how it negatively compares to the Japanese original? I think we have, but I can't be sure. Anyway, I really wish NOA's designers would take another stab at it and try something different next time around. The Japanese logo is so much more creative and evocative, IMO. We did, I think that's why it came to mind! It was a fun conversation as I recall, and the Japanese logo is so much fun I can't believe that the US team didn't try to adapt it better, I mean how could they resist? BTW I couldn't resist playing around with a few corners on the Hometown Story logo (just quick work that wasn't worth saving) and they absolutely could have rounded them down more (someone with more logo experience probably could have said so without drawing on top of the logo..). Ah, I thought so! BTW, I hope nobody misunderstands me when I talk about the AC logo in this way. I don't hate the NA AC logo. I just think it could be better--more creative, like the JP logo. I like all of the things Michael pointed out re: the NA cover, but I also prefer the JP one. I think the foresty background of the NA cover is too detailed with too many color shades in comparison to the simpler (but appealing!) characters. The JP cover feels more consistent. Ah, yes, I think that's my problem with the NA cover, too--aside from all of the logos. Maybe if the backdrop were a bit softer, or out of focus? From what I know of it, it's looks like something I'd enjoy. I played the GameBoy Color version of Harvest Moon nearly to death back in the day. It doesn't have a chance of getting played by me anytime soon; Pokemon is going to be dominating my gaming for weeks. I'm going with the US art for reasons already mentioned by others. Though I agree It could use less logos. 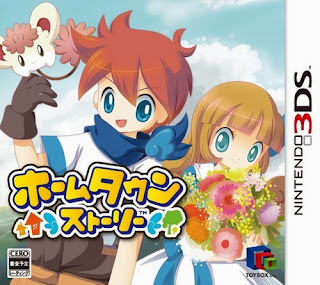 As for the game it self all I know is that the Harvest Moon guy and one of the Pokemon art guys is involved with it. I never played any of the Harvest Moon games or any of its spin-offs like Rune Factory but I'm figuring it will be little like taht series. Oh, I hear ya RE: Pokemon taking over your gaming life soon enough, Terry. Although I'm very much looking forward to this game, it's going to arrive on my doorstep at an awkward time--just a few weeks after Pokemon. Oh, well, I'll do my best to give it a go and report on my thoughts here anyway. I'm sick of my backlog getting bigger and bigger! Yes, this game is supposed to be more like Harvest Moon than Rune Factory, as far as I'm aware, Sam--and even then it's more about running a shop than running a farm. Also, I'm not even sure there's a romance element this time around. Yay another person who is looking forward to this game! I personally prefer the Japanese one because the lines are so much more softer if that makes sense lol. It is far less cluttered then the American one. The American one has so many different messages and I don't like how they put the Harvest Moon logo on it.